Lukens Technologies LLC offers high quality models of military and commercial airplanes, missiles, spacecraft, helicopters, ships, automobiles and armored vehicles. Our models come ready to display. Each piece is hand crafted with attention to detail. Our models are ideally suited as collectibles, executive gifts, promotional incentives, art displays, and marketing aides. We can personalize a model to your and needs. Feel free to take a look at past projects in the gallery or contact us if you have any questions. In January of 2017 a 3ft long 1/200 scale USS San Francisco CA-38 from WWII was started. It is currently in progress and in progress photos can be found here. In January of 2017 a beta build of a CF-101 was completed for M&B Industries. It turned out quite nice. At the same time we finished one of the first constructions of a U-Wing design that was just released. In December of 2016 a 1/6 scale model of a Harley Davidson Model 6 from 1910 was constructed for a client. The recipient has it on display and receives many questions about how it was made. 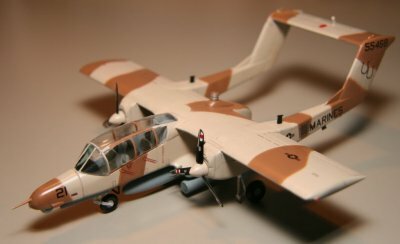 In October of 2016 a 1/100 scale model of a German ASW/Harbor vessel was completed, the KFK-363. A late summer of 2016 commission was completed for the construction of an artsy wall mountable wolf's head. In early 2016 a 1/450 scale (5.5ft long) model of the Sulaco from the Aliens franchise was completed. This build took around 1200 hours over a three year span. In late 2015 a large scale DC-3 was created and auctioned off as part of a benefit dinner for the Motts Military Museum. Manned Spacecraft Rollup: In the Motts Military Museum you can find a large number of 1/48 scale models of manned spacecraft. These are part of the NASA display at the museum and features vehicles made by NASA, the Soviet space program, and Scaled Composites. The majority of these models were constructed in 2010-2013 with the Soyuz built in 2016. The group is made up of the following: Ares-1X, Command Module and LEM, F1 engine, Titan Gemini, Hubble telescope, Mercury Redstone, Mercury Atlas, Saturn 1-B, Saturn V (7.5ft tall), Space Shuttle, Soyuz, and SpaceShip One. Armor Rollup: In 2013 a number of armor vehicles were constructed. As a beta build for another designer a model of a M2A2 Bradley which became the cover art for the model. Also constructed were models of the M1A2 Abrams and a MRAP. Science Fiction Rollup: From 2009 to 2015 a number of science fiction models have been constructed from StarTrek, StarWars, and other fictional universes. This group is made up of the Enterprise (1/400), Battlestar Galactica, Millenium Falcon, Renshead, Rodger Young, USS Kelvin, and USS Reliant.